November is Pancreatic Cancer Awareness Month – do you know the symptoms? Pancreatic cancer is one of the nation’s deadliest cancers with a five-year survival rate of just nine percent. November is Pancreatic Cancer Awareness Month. Pancreatic cancer is one of the nation’s deadliest cancers with a five-year survival rate of just 9 percent. It’s a disease that kills more people than breast cancer in the U.S.
Pancreatic cancer claimed the life of Aretha Franklin in August 2018 and Michigan Opera Theatre champion David Dichiera a month later in September. Jerry Lawrence, 65, is grateful their families shared the diagnosis. The Detroit resident learned he was facing pancreatic cancer in August 2017. “[I] started having some tummy aches, pains in my stomach. I was like what is that?” Lawrence recalled. He’d also lost a lot of weight and had recently been diagnosed with diabetes. A CT scan revealed he had stage 4 pancreatic cancer. He couldn’t believe it. “I had never been sick in my life. 'Dude! Where? Are you sure?' ” he remembered asking the doctor. The oncologist gave him three to six months to live. Lawrence sought a second opinion at U of M Cancer Center. He’s been undergoing chemotherapy treatments ever since. Family and friends have helped with medical bills. Legendary boxer Tommy Hearns was among those at a recent fundraiser. Lawrence has also started working with the Pancreatic Cancer Action Network to raise awareness and important funding for early detection methods. “We do need to catch this early. When you’re catching it so late, it just becomes so difficult to try and attack. 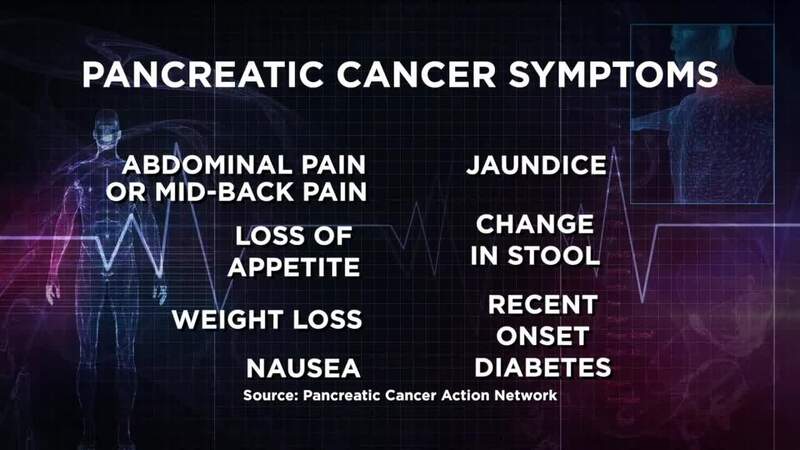 And part of the reason for that is just because the symptoms are very vague,” explained Pancreatic Cancer Action Network volunteer Loredana Gianino. But it is important to know those vague symptoms. If you are experiencing one or more of these unexplained symptoms, see your doctor. Here is a link to a list of Risk Factors provided by pancan.org. Lawrence focuses on staying positive. A lapel pin his niece designed now sports his own motto — "Always on the positive tip!" And his sister sent him a sign he posts proudly in his living room. “’I can. I will. End of story,' " read Lawrence. "Meaning I will defeat. I will be a survivor. And I’ll have a story to tell." World Pancreatic Cancer Day is Thursday, November 15. If you’d like to support the effort, you can wear purple that day and spread the word about the warning signs of this disease.